One of the first things I do on Saturdays is try to choose a subject for my blog. This morning I didn’t have to think very long about it. As so often happens lately, there was a song stuck in my head and I just had to find out what it was. You see, I’ve been taking a zumba class for a few weeks and the catchy tunes as well as the dance moves seem to have grabbed hold of my subconscious. And there it was: the topic I was searching for! What is zumba, you might ask? Well, it’s a workout first created in 1986 by fitness instructor, Alberto “Beto”Perez, when he forgot the music for the aerobics class he was teaching in his native Colombia. Luckily, in his backpack he had a tape of salsa and merengue music which he then used to improvise the class. Dancing to the lively tunes really caught on. 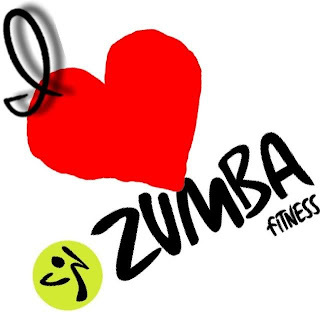 Around the year 2000, he and his collaborators (also both named Alberto) licensed a company and brought zumba videos to the U.S. Today this worldwide phenomenon encompasses a variety of fitness levels which range from Zumba Gold and Aqua Zumba in the pool for older populations to Zumba Toning which uses toning sticks—whatever that might be! Our class, taught by an upbeat and encouraging young woman named Tina, consists of a fairly wide range of ages. As for ability, you’re moving so fast trying to keep up with the instructor that you don’t notice how you or others are managing! It’s a whirlwind of an hour, fun and quite tiring. Just the right thing for a calorie-burning, cardio workout. A bonus: you really sleep well after all that exercise. Music for the class comes from many different countries and styles: salsa, flamenco, mambo, chacha, to name but a few. In our case, English-language songs are represented by the likes of American pop artist Katy Perry with Firework and also LMFAO's Party Rock Anthem. For a cool down we dance to I've Had the Time of My Life by Bill Medley and Jennifer Warnes. And there’s Dynamite by British singer/rapper Taio Cruz. From the French music industry comes Rock This Party (Everybody Dance Now) by Bob Sinclar (born Christophe Le Friant in Bretagne) and Marseille’s DJ Mam who performs Zumba He, Zumba Ha which combines Spanish, French, and creole lyrics. Another favorite of mine is Zumbanessa's merengue tune El amor, even if I don’t understand all of the words. Just click on one of the above links and see if the music doesn't get your toes a-tappin'! Zumba is a great way to get in your exercise and have fun while you're moving and sweating. ‘Tis the season for food excesses of all kinds. Woohoo! As for desserts, most Americans have already indulged in the apple and pumpkin pies that normally accompany the Thanksgiving feast. My preferred sweet courses consist of, but are not limited to, fruit- and chocolate-based goodies which are often heavenly rich and satisfying. There are so many good ones to choose from, many from France, bien sûr : crêpes, mousses, clafoutis... Although I can’t possibly discuss all of my favorites, I thought I’d concentrate on three today which are so good and not too difficult to make. 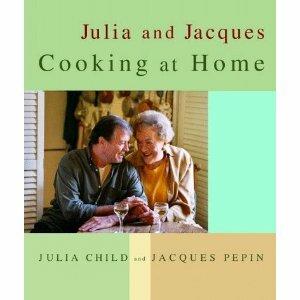 From a much-loved cookbook I’ve mentioned before, Julia and Jacques Cooking at Home, comes Pépin’s recipe for a rustic fruit tart. This pie combines two great qualities: it is delicious and easy. You begin by making the crust which is practically fail-safe. Put 1½ cups of flour into a food processor with a pinch of salt. Add in 1½ sticks (or 6 oz.) of cold butter a little at a time and pulse until the mixture resembles small peas. Sprinkle 1/3 cup of ice water into the processor and mix until moistened. Then knead the dough a few times on a lightly floured board and roll out to about ¼ inch thick. Put the dough on a baking sheet lined with parchment paper or aluminum foil. Mix together 2 tablespoons of sugar and 1 tablespoon of flour and scatter it over the top of the dough. Peel, core, and slice 4 Golden Delicious apples (or a mixture of any fresh and dried fruit you like) and overlap the pieces on the dough, starting 3 inches from the edge, going in concentric circles. 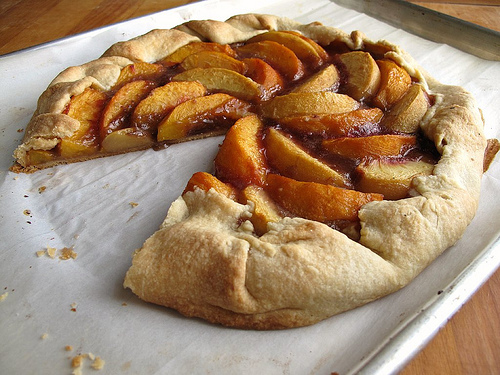 Fold the dough up over the fruit in an unsystematic way (hence the word rustic). Brush the fruit with 2 tablespoons of melted butter and sprinkle with 1½ tablespoons of sugar. Refrigerate for 10 minutes and then bake at 400 degrees for about an hour till the crust is golden. Brush the tart with 2 tablespoons of melted, strained apricot preserves for a beautiful tasty glaze. Yum! The following recipe does not normally contain either chocolate or fruit, but it does have heavy cream in it, so it’ll do just fine! 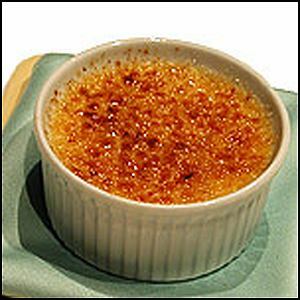 We had a somewhat non-traditional meal at Thanksgiving this year which included crème brûlée for dessert. The making of this French custard is not too hard and the results are terrific. First, preheat the oven to 325 degrees. Bring a quart of heavy cream and a split, scraped vanilla bean to a boil in a saucepan over medium-high heat. Remove from the burner and let the mixture sit for 15 minutes. Whisk together ½ cup of sugar and 6 large egg yolks in a bowl. Then comes the only tricky part: slowly add the warm cream mixture to the beaten eggs, about a ½ cup at a time, constantly beating. Pour into 6 8-oz. ramekins and place in a large Pyrex baking dish. Fill the dish with hot water so that it comes half-way up the sides of the ramekins. (One good idea is to put a clean kitchen towel at the bottom of the dish to prevent movement). Bake 40 to 45 minutes till the custard is still jiggly but set. Refrigerate the ramekins for at least 2 hours. What makes the dessert brûlée is burning some kind of sugar on the top of the cream mixture. Professional chefs use a small hand torch for this purpose, but the broiler setting of the oven is much safer for us mere mortals. Remove the ramekins from the fridge 30 minutes before placing them back in the oven. Sprinkle about a ½ cup of brown sugar evenly and broil to form a crispy top. Let sit 5 minutes before serving. The final dessert resembles the previous one but it is the chocolate variety, much like a mousse: the simple but lovely pot de crème. 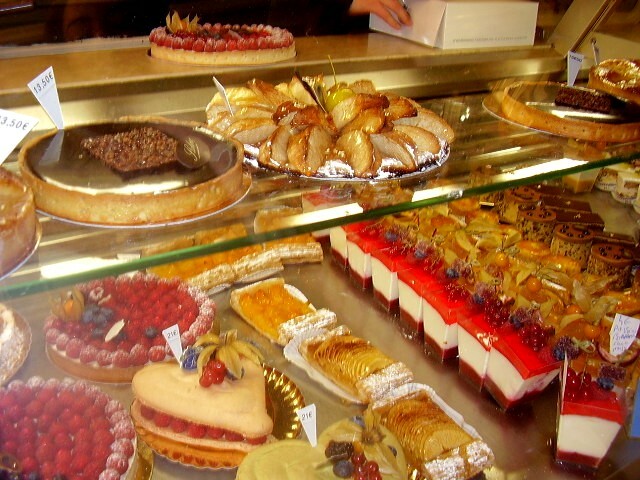 We first tasted this unbeatable French treat years ago in a restaurant outside of Boston. Preheat the oven to 375 while melting 3-oz. of bittersweet chocolate in a double-boiler. (You can, of course, improvise by setting a pan on top of another that has simmering water in it.) Meanwhile, scald 2 cups cream with 1 cup of milk, being careful not to let it boil over. Beat together 5 egg yolks with ¼ cup of sugar, and a pinch of salt. As in the previous recipe, very slowly add the warm cream to the egg mixture so as not to have scrambled eggs! Pour the egg/cream mixture through a fine sieve into the melted chocolate. Whisk until smooth. Then proceed as in the above recipe: fill ramekins, put them in a baking dish, fill ½-way up with hot water. One difference is that you cover the dish with aluminum foil before baking about 35 minutes or until firm. 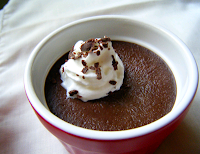 Refrigerate 2 to 3 hours and serve cold with whipped cream if the dessert itself is not rich enough for you! There you go! Hope you'll try them.